World Junior and U23 Championships are just around the corner! The posts today will focus on the US and Canadian teams, subsequent posts will look at some of the other top nations. WJCs and U23s are rolled into the same week of racing, although they split up the results by age group. 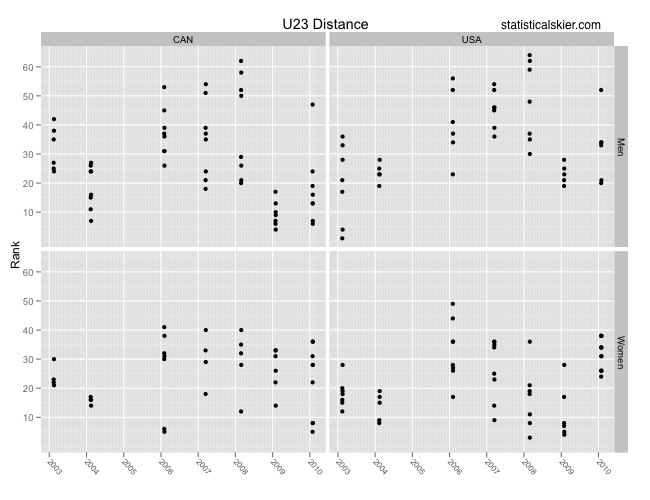 U23s in particular is a fairly young event, so there isn’t a lot of data on past performance. In fact, it was cancelled once or twice, and some of the earlier race results are actually tough to find on the web at all. Participation in U23s has also been spotty, with not every top nation sending athletes every year. For both of these posts I’m going to stick to rank rather than FIS points. I think that it will be clearer, since a lot of people have a rough idea of what a particular finish at WJCs “means”, and I think we won’t lose too much information about how “far back” the athletes were. 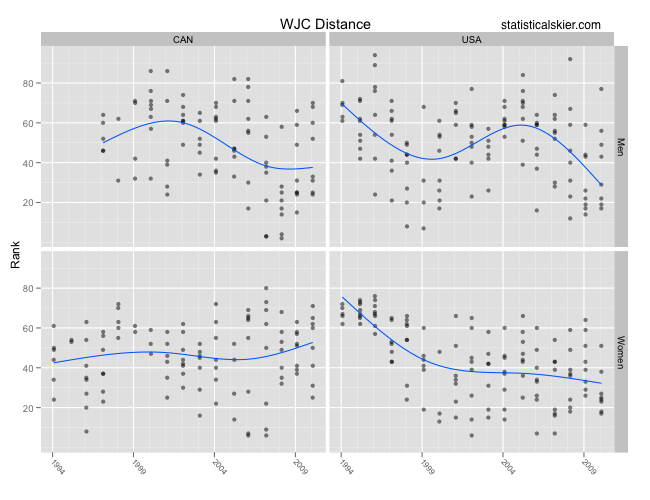 This was the only combination (WJCs + distance) with enough data for me to feel comfortable including trend lines. The best results for both nations are when they break into the top ten, or perhaps the top twenty. The US men had a fairly long run of mediocre results in the mid-2000s but have returned to “normal” over the last few years. The Canadian men had two years of better than usual results thanks to Alex Harvey, but things have pulled back towards the low twenties since then. After some pretty terrible results back in the 90’s, the US women had a decent number of top twenty results post-2000 from athletes who are either retired or not quite competitive at the national level anymore (e.g. Lindsey Dehlin, Kristina Trygstad-Saari, Aubrey Smith, Lindsey Williams, Tara Hamilton). The Canadian women had a handful of surprisingly good results in the mid-2000’s (e.g. Amanda Ammar, Perianne Jones and Brittany Webster) but generally they’ve hovered around 40th or so. A few differences. Note the steady supply of top twenty finishes for the US women and Canadian men. The US men had a lot of strong sprint results early on (e.g. Ryan Foster, Chris Cook, Leif Zimmermann, Andrew Newell, Torin Koos, Eric Strabel and even Kris Freeman!). Interestingly, those early sprint races were also all freestyle. The US women have had a steady stream of decent sprint results (e.g. Lindsey Williams, Morgan Smyth, Kikkan Randall, Melissa Oram Schwartz, Aubrey Smith, Katie Ronsse, Rebecca Dussault, Ida Sargent, Rosie Brennan, Sophie Caldwell, Sadie Bjornsen). 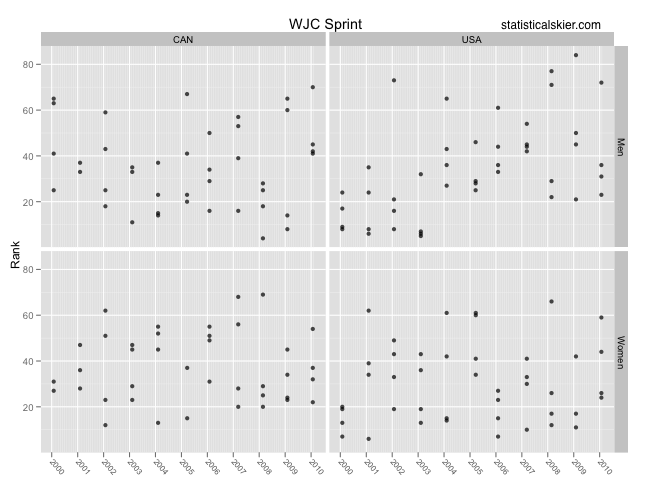 In general,the Americans tend to do somewhat better (measured by finishing rank) in the sprint events, whereas the Canadians are somewhat the opposite. If you look at the 30 best results for the Americans (men and women), 18 are from sprints. The Americans have twice as many top tens in sprints (12) as they do in distance events (6). The Canadians best 30 results are slightly more evenly split with 16 in distance events and 14 in sprints. The American’s relative success in sprinting has come almost exclusively in freestyle sprints. Much if this is due to the fact that the US men had so many good sprint results early on when they only held freestyle sprints. U23s are a bit harder to assess, since the competition at those events has been more uneven over the years. This means that finishing rank can be a litte more deceptive, masking weakly competitive fields. Posted by Joran on Thursday, January 20, 2011, at 6:00 am. Filed under Uncategorized. Tagged can, canada, Distance, junior, preview, Sprint, USA, WJC/U23. Follow any responses to this post with its comments RSS feed. You can post a comment or trackback from your blog.